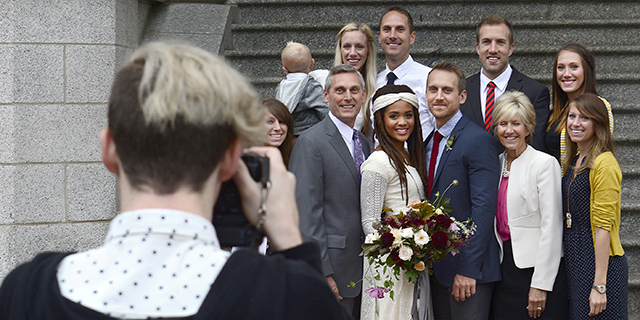 Throughout U.S. history, marriage has been tied to religion and religious institutions. Today, virtually all faith traditions have rules and ceremonies regarding marriage and, in the United States as well as in many other countries, clergy of different religious groups are authorized by the government to perform weddings. In the U.S., roughly half of all American adults (48%) say they are married, according to the 2014 Religious Landscape Study. Much smaller shares of U.S. adults say they are living with a partner (7%), are divorced or separated (13%), or are widowed (7%). A quarter of Americans say they’ve never been married. 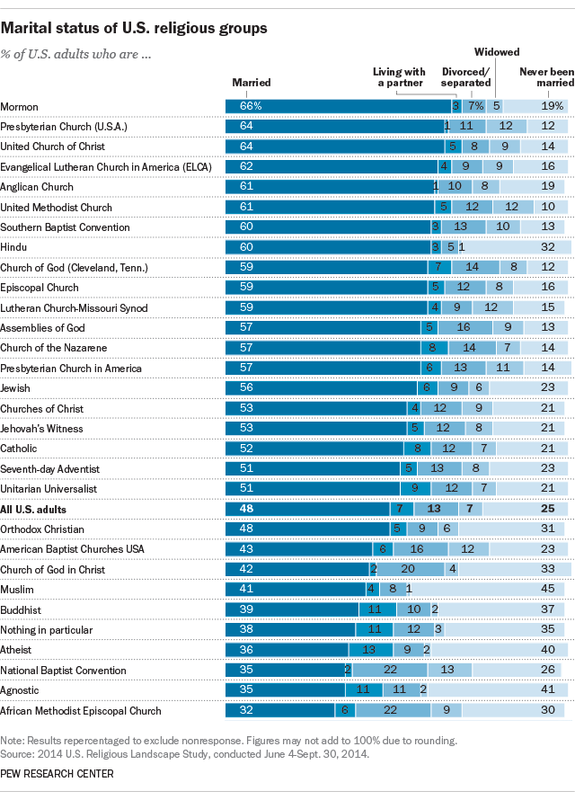 In certain U.S. religious groups, a higher-than-average share of adults say they are married. For instance, six-in-ten or more Mormons, members of the Presbyterian Church (U.S.A.), and members of the Evangelical Lutheran Church in America are married. The same holds true for Hindus, Southern Baptists and members of the Episcopal Church. By contrast, fewer than four-in-ten atheists, agnostics and those who say their religion is “nothing in particular” are married. Similarly, Buddhists (39%) also are less likely than the general public to be married. Religious groups whose share of married adults is comparable to shares seen in the general population include Catholics (52%) and Orthodox Christians (48%). Of course, there are many factors associated with marriage rates. For instance, Americans who have a college education are more likely than those with less education to be married. 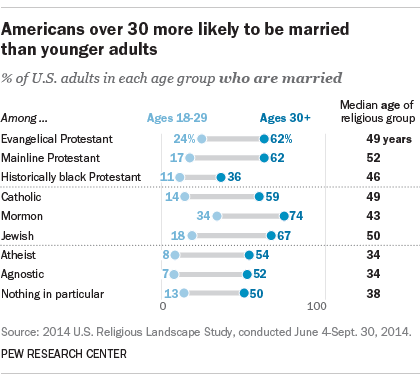 Age also is a big factor in determining which religious groups have a higher or lower share of married adults. In short, those groups that have more young people tend to have a smaller share of married adults and vice versa. That’s in part because younger Americans are less likely than their older counterparts to be married. In fact, among adults between the ages of 18 and 29, just 16% are married, compared with a majority (57%) of adults over the age of 30. Atheists and other religiously unaffiliated adults are a case in point. The median age of atheists is 34, much younger than the median age of the population as a whole (46 in the 2014 Landscape Study). And while only 8% of the youngest atheists (those under age 30) are married, 54% of those 30 and older have a husband or wife. A similar relationship between age and marriage exists among agnostics and those who say their religion is “nothing in particular.” And the same holds true among members of most other religious traditions analyzed in the Landscape Study. But the survey shows that even after age is taken into account, there are still significant differences in the share of married adults across religious groups. Even when the analysis is restricted to adults over the age of 30, self-identified atheists, agnostics and those whose religion is nothing in particular are still somewhat less likely than Mormons, Jews, evangelical Protestants, mainline Protestants and Catholics to be married.